You'll know that your timesheets must be signed off by a line manager or site manager. 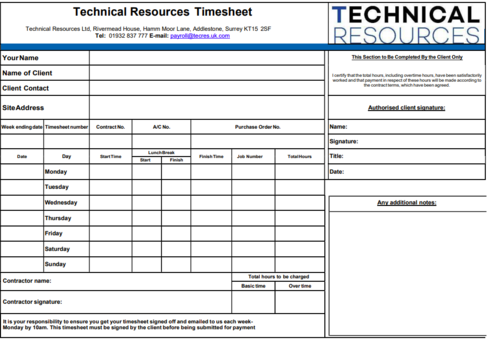 Please send your completed timesheets to payroll@tecres.uk.com before 10am on Monday morning to ensure that payment can be made on time. If there is no one available on site to sign off a timesheet, then a completed timesheet with days and hours worked must be sent to the client and ‘CC’ in the email address payroll@tecres.uk.com. Please remember that this must still be completed by 10am on Monday morning.